MHS celebrated in style the grand re-opening of the 1907 historic library on June 27, 2009. 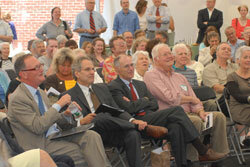 Over 600 guests attended the library dedication and enjoyed informal tours of the Library, the Longfellow House and garden, and the exhibition “Re/Collected: Great Works and New Discoveries from the Brown Library.” Keynote speaker Barry Mills, President of Bowdoin College, was joined by Earle Shettleworth, Alan Taylor, Karen Baldacci, Chris Livesay, and Richard D’Abate, in heralding the growth of MHS as a cultural icon in the State of Maine. Newly-named by a descendent, the Alida Carroll and John Marshall Brown Library has been transformed into a state-of-the-art research facility, providing first-rate care of the collections. A $9.5 million campaign made way for a new 11,000 square foot wing, which provides expanded storage, climate control, and a home for the Maine Memory Network. Thanks to hundreds of gifts from individuals, foundations and corporations, the total funds raised-to-date for the campaign exceeds $8.8 million. 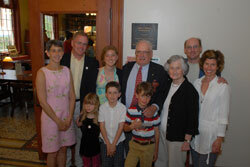 To help us reach our goal for the campaign, please consider making your own gift to support the Brown Library. Give to the campaign today using our secure online donation form. 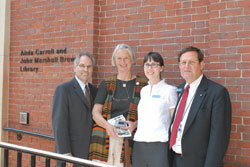 Seth, Suzanna, and Laura Fecych Sprague, guest curator of the Museum Exhibition "Re/Collected: Great Works and New Discoveries from the Brown Library"
Dedication Speakers: Barry Mills, Richard D’Abate, and incoming MHS President of the Board of Trustees, Chris Livesay. 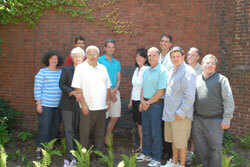 Pelligrino ("Pete") DeSarno and Family, descendents of longtime Longfellow Gardener Pasquale ("Patsy") DeSarno. Executive Director Richard D’Abate shares a moment of gratitude with MHS member Larney Otis, and Librarians Jamie Rice and Nick Noyes. 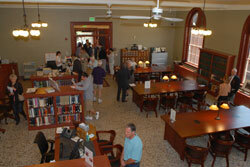 Visitors explore the renovated library throughout the day. 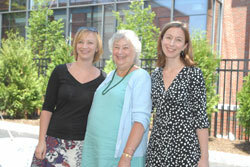 Debbie Reed, Chair of the MHS Capital Campaign, enjoys the celebration with her daughters Mary and Torie. 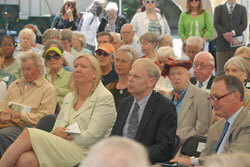 Speakers included Karen Baldacci, Maine’s First Lady, and Earle Shetteworth, Maine State Historian. 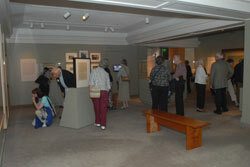 Many people explored the Maine Historical Society’s new exhibition which includes a rare, original copy of the Declaration of Independence, printed by John Dunlap on July 4, 1776. 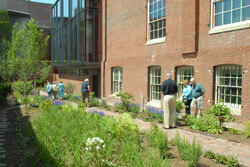 Throughout the day, members of the Longfellow Garden Club, provided tours of the recently re-opened Longfellow Garden. 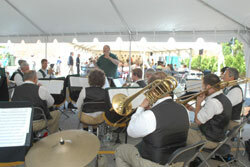 The Carter Mountain Brass Band entertained guests under the tent. 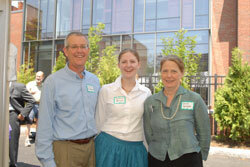 Members of the Brown, Payson, Hildreth, Snow, and Morris families reunite at the celebration. 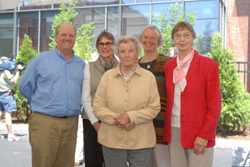 From left to right: Daniel Morris, Alison Hildreth, Mary Morris, Larney Otis, and Lee Snow. Alice Branson, who has been an MHS member for 50 years, takes a moment to relax in the Maine History Chair that she named. 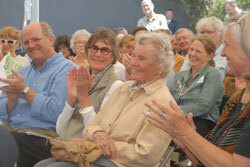 She is joined by (left to right, front row): Judy Plummer (sister), Alice Branson (center), Alex Taylor (daughter). 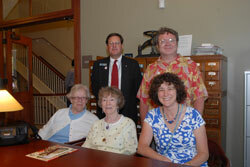 Also pictured (back row left to right): MHS Librarian Nick Noyes and John Plummer (nephew).